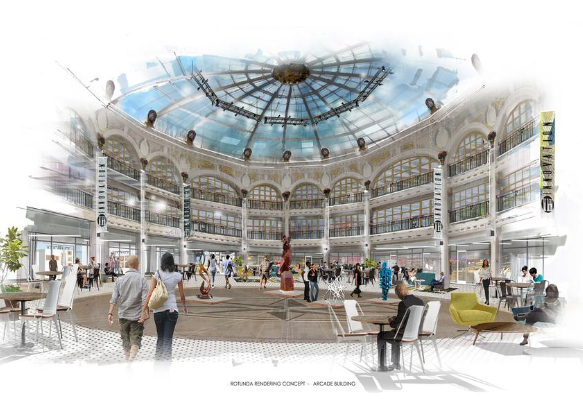 In what’s been dubbed “the most complicated project” in rehab history, The Dayton Arcade is closing in on a significant milestone. Anchor tenants The University of Dayton and The Entrepreneurs Center have signed 10-year leases at the Arcade, positioning the project to close on its financing. “We are proud to partner with The Entrepreneurs Center to deepen our commitment to the Dayton community as an anchor tenant of this historic and important downtown space,” said UD President Eric F. Spina. “Our innovation hub will fuel economic growth and spark creativity by enabling students, faculty and staff from across campus, including engineers, artists and business majors, to work alongside local entrepreneurs.” The project will create affordable artist housing, retail and restaurants, a public event space, new arts programming spaces and a 95,000-square-foot innovation hub.